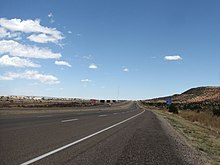 This article is about the section of highway in New Mexico. For the entire length of highway, see Interstate 40. Interstate 40 (I-40), a major east–west route of the Interstate Highway System, runs east–west through Albuquerque in the U.S. state of New Mexico. It is the direct replacement for the historic U.S. Highway 66 (US 66). As I-40 enters New Mexico in a northeasterly direction it begins following the basin of the intermittent Puerco River, roughly tracing the southern edge of the contiguous part of the Navajo Reservation in the state. The freeway enters Gallup twenty miles (32 km) later paralleling the Burlington Northern Santa Fe Railway's southern transcontinental mainline. Leaving Gallup the now more easterly I-40 passes to the north of Fort Wingate and part of the fragmented Cibola National Forest before crossing the North American continental divide at an elevation of 7,275 ft (2,217 m), with 11,305 ft (3,446 m) stratavolcano Mt. Taylor towering to the east. The highway traverses more of the Navajo Reservation and the Cibola Forest before turning southeast and crossing a malpaís. After serving interchanges near Grants, the freeway, coinciding with the northern boundary of El Malpais National Monument, crosses another malpaís, turns east and enters the Acoma Indian Reservation, home of the Acoma Pueblo. The route leaves the Acoma Indian Reservation with Mt. Taylor to the north and enters the Laguna Pueblo. Near the interchange with New Mexico State Road 6 (NM 6) the railway line that accompanies much of the route from the Arizona border diverts to the south while the freeway turns east by northeast towards Albuquerque. The route departs the Laguna Pueblo, briefly transits the Tohajiilee Indian Reservation (a chapter of the Navajo Nation), crosses the Rio Puerco and begins a steep climb to the top of a mesa marked by several small cinder cones overlooking the Rio Grande rift and Albuquerque. From Laguna to the Route 66 Casino, I-40 has at-grade intersections with a number of ranch access roads in violation of Interstate Highway standards. These intersections are a vestige that remain from the conversion of US 66 to I-40 during the latter part of the 20th century. Interstate 40 diverges from the former US 66 alignment (Central Avenue) at an interchange with Atrisco Vista Boulevard on the West Mesa that overlooks Albuquerque. I-40 descends Nine Mile Hill as it enters the city of Albuquerque, and intersects 98th Street, Unser Boulevard (NM 345) and Coors Boulevard (NM 45) before crossing the Rio Grande. The freeway then skirts the northern edge of downtown Albuquerque before intersecting Interstate 25 at a 5-level stack interchange (Big I). East of I-25, I-40 continues east, then turns southeast passing through Uptown before intersecting Old US 66 (now signed as NM 333/Central Avenue) at Tramway Boulevard (NM 556) as it leaves Albuquerque and enters Tijeras Canyon. This section of I-40 is also referred to as the Coronado Freeway. East of Albuquerque, Interstate 40 crosses the Sandia–Manzano Mountains by traversing Tijeras Pass, reaching its highest point of 7,200 feet at Sedillo Ridge. Continuing east, I-40 descends out of the mountains and into the Estancia Valley while passing through the town of Edgewood (m.m. 187). The highway continues east across the Estancia Valley, passing through Moriarty (m.m. 194). Before reaching Clines Corners, I-40 ascends into the Pedrenal Hills, a region of hills and low-level ridgelines averaging around 7,000 feet in elevation. East of Clines Corners,( m.m. 217) I-40 gradually descends from the Pedrenal Hills region and into the High Plains of eastern New Mexico. At Santa Rosa (m.m. 273) I-40 crosses the Pecos River, and then continues east-northwastward co-signed with US 54 to Tucumcari. At Tucumcari, I-40 diverges from US 54 and turns eastward and skirts the northern edge of San Jon before reaching the Texas state line at Glenrio. Planning and construction of Interstate 40 through New Mexico began shortly after the Federal Highway Act of 1956 created the Interstate Highway System. First sections of I-40 through the state were completed by 1960 including a short section west of Tucumcari in Quay County, from a point just west of Santa Rosa west past Clines Corners to just east of Moriarty, along with a section on the east side of Albuquerque and another section from near Cubero to Grants, which included a new spur route connecting the Interstate Highway with U.S. 66 on that city's east side. Construction of I-40, generally paralleling the existing U.S. 66 in some sections and replacing the older route in others, was hobbled for a few years during this decade by the New Mexico Legislature's passage of an Anti-Bypassing Law that prohibited the construction of an interstate bypass around a city or town opposed to it. That law was repealed in 1966 following a threat of loss of federal funds and most New Mexico cities along I-40, I-25 and I-10 then worked out agreements with state and federal highway officials in determining where the bypass routes around their municipalities should be located. By the end of the 1960s, most rural sections of I-40 were completed across the state with the largest exception being a 40-mile (64 km) stretch east of Tucumcari to the Texas border at Glenrio, where traffic was diverted to the old U.S. 66. That section of highway by this time became locally and nationally known as "Slaughter Lane" due to tremendous amounts of traffic for a two-lane highway along with rough and narrow paving which led to numerous injury and fatal traffic accidents that reached epidemic numbers in 1968 and 1969. Construction on this section of I-40 was held up by a dispute at San Jon concerning a proposed routing of I-40 bypassing that city to the north by some five miles (8 km), which was resolved in November 1969 when federal and state officials agreed to bring the bypass closer to the city along its northern limits. However, aside from a few small villages such as Montoya, Newkirk and Cuervo in the eastern portion of the state and Laguna, Budville and Cubero to the west, no major bypasses had been entirely completed in New Mexico so traffic was still diverted over the U.S. 66 routes through each of those cities. In 1970, I-40 was entirely completed through the city of Albuquerque. Other bypasses were completed around various cities through the state including San Jon (1976) and Tucumcari (1981), Santa Rosa (1972), Moriarty (1973), Grants (1974) and Gallup (1980). 25.96 16 NM 118 – Gallup Western terminus of former I-40 Bus. 42.23 26 NM 118 – Gallup Eastern terminus of former I-40 Bus. 85 NM 122 west to NM 547 – Grants, Mount Taylor Eastern terminus of NM 122, eastern terminus of former I-40 Bus. 529.39 329 I-40 Bus. / Historic US 66 east Western terminus of I-40 Bus. 537.42 333 US 54 east (Mountain Road) Eastern end of US 54 overlap, former US 54 Bus. ^ Public Roads Administration (August 14, 1957). Official Route Numbering for the National System of Interstate and Defense Highways, As Adopted by the American Association of State Highway Officials (Map). Scale not given. Washington, DC: Public Roads Administration. Retrieved June 16, 2011 – via Wikimedia Commons. ^ "Interstate Routes" (PDF). New Mexico Department of Transportation. Retrieved December 2, 2010. ^ "Historic Route 66: The Mother Road" (PDF). County Star-News. Shamrock, TX. March 15, 2012. pp. E2–E8. ^ a b "Route 66 History Page". www.route66world.com. ^ Sonderman, Joe (2016). Route 66 Roadside Signs and Advertisements. Voyageur Press. p. 89. ^ New Mexico Department of Transportation (2007). Statewide Milepost/Point Map (PDF) (Map). Scale not given. Santa Fe: New Mexico Department of Transportation. Archived from the original (PDF) on July 22, 2013. This page was last edited on 19 February 2019, at 04:34 (UTC).